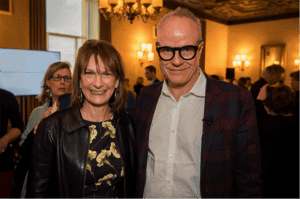 The Appraisers Association of America awarded the world-renowned curator Hans Ulrich Obrist with the 2018 Award for Excellence in the Arts at the organization’s 14th annual Award Luncheon on April 18 at the New York Athletic Club. Welcomed by Javier Lumbreras, Obrist was preceded by keynote speaker Michael Bloomberg former New York City Mayor; Patricia Harris, CEO of Bloomberg Philanthropies, and artist Ian Cheng. “It is said that no one sees more art, talks with more artists or writes more about art than our 2018 honoree Hans Ulrich Obrist. Through his insatiable desire to digest information, art related and other, Hans facilitates our understanding and appreciation of the work we experience,” said Linda Selvin, executive director of the Appraisers Association of America. Since the inaugural Award Luncheon in 2005, this event has grown to include over 300 guests, with leaders in the arts, financial, and legal professions gathering to recognize visionary contributions made to the arts. 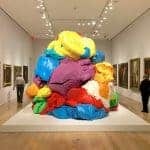 Past honorees include curator and dealer Jeffrey Deitch, artist Frank Stella, artists Emilia and Ilya Kabakov, art critic Peter Schjeldahl, artist Ai Weiwei, art historian Linda Nochlin, gallerist Arne Glimcher, collector/philanthropist Martin Margulies, former director of the Solomon R. Guggenheim Foundation Thomas Krens, art historian John Richardson, historian Wendell D. Garrett, artists Christo and Jeanne-Claude, and arts educator and museum founder Susan Weber. With over 300 exhibitions curated, Obrist is the artistic director of the Serpentine Galleries, and prior to this, he was the curator of the Musée d’Art Moderne de la Ville de Paris. Obrist has lectured internationally at academic and art institutions and is a contributing editor to the magazines Artforum, AnOther Magazine, 032C, a regular contributor to Mousse and Kaleidoscope and he writes columns for Das Magazin and Weltkunst. 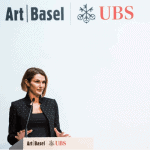 In 2011 he received the CCS Bard Award for curatorial excellence, and in 2015 he was awarded the International Folkwang Prize for his commitment to the arts.